I bet this holiday season quite a few of you out there are going to be getting new videocards. After all only videocards (aside from maybe a new processor) can dramatically increase your gaming enjoyment. While Crucial is not a name you'd think of when purchasing a videocard, they've been selling their own branded cards for the last year or so. After some initial teething problems, Crucial now sells some of the best high end ATi videocards on the market. Team that up with Crucial's excellent level of customer service and it's not hard to see why their cards are gaining so much popularity! Now Crucial are offering some options for the budget/mainstream market as well. 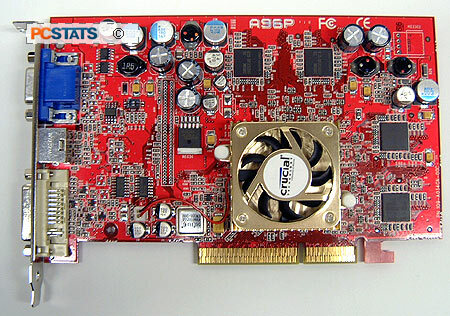 Today we're going to check out one of Crucial's mainstream cards; the Radeon 9600 Pro. While the 9600XT has been released, it's only marginally faster than the older 9600 Pro due to the higher core speed. What is more significant is that the release of the 9600XT causes the prices of other cards, such as the 9600 Pro to drop! This is especially important as videocards are hitting all time pricing highs. 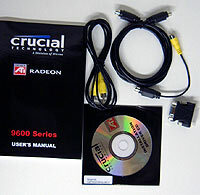 For $230 CDN ($175 US) you can get the Crucial Radeon 9600 Pro and all its goodness. The card comes with all necessary cables, (S-Video to S-Video, S-Video-Composite and Compsite-Composite) to take advantage of the VIVO feature. There's also a DVI-Analog Adapter if you want to use two analog monitors, a users manual and a copy of WinDVD. 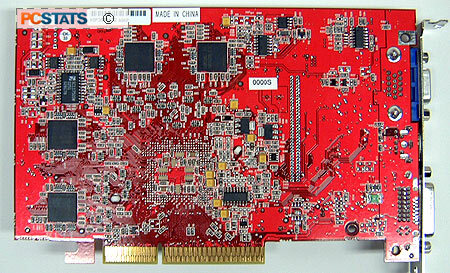 The Crucial Radeon 9600 Pro uses a red PCB and is based on the reference Radeon 9600 Pro design set forth by ATI. The card appears to have been produced by FIC, given the "A96P" lettering on the PCB, and benchmarks which identify the card as a FIC descendent. FIC OEM a lot of products to other manufacturers, so this is not too surprising.